My father probably has Alzheimer’s disease. Signs of dementia are becoming more obvious. My parents have been living with us for four years. As he slowly deteriorates, the caregiving that my husband Ralph and I do is, of course, increasing. It’s difficult, it’s sacrificial and time-consuming, and it’s a gift we give to Jesus. But it’s not easy to feel compassionate about it, let alone cheerful in the gift-giving. Therefore, I felt delighted when I found a website that uses 360° Virtual Reality videos to help people understand what it’s like to have dementia. “A Walk Through Dementia“, presented by Alzheimer’s Research UK, puts you in the shoes of someone living with dementia. It uses the inexpensive Google Cardboard headset, which inserts Android phones to display the scenes (and it might work on other VR headsets, I don’t know; I only have Google Cardboard at this time). There are many today who have a loved one suffering from this disease. But I hope that everyone will watch these three very short videos. 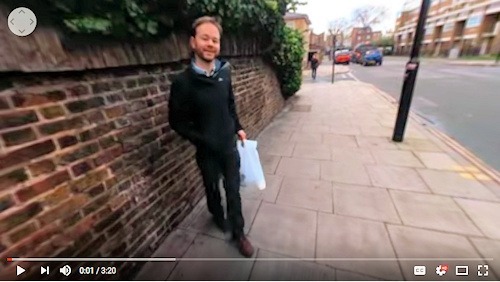 If you don’t have Google Cardboard, you can still experience A Walk Through Dementia by watching it on YouTube and pushing the video around to see in all directions. You’ll find the videos at the bottom of the page that’s linked above. As our world population ages, we can become much better instruments of Christ’s mercy if we understand dementia from the inside out. This entry was posted in Exploring VR on October 19, 2016 by Terry Modica.